I'm getting hooked on washi tape. It's really kind of adorable, and there are so many fun things you can do with it. I am trying to resist the urge to buy one of every color and pattern I see. Target even has some. Did you know that? I found black polka dot in the scrapbook section, and a few multi-packs in the office supply area. Both Very Jane and Groopdealz are featuring a washi tape deal today. Did you see? Go over and check them out! I was going to create a tutorial, but I somehow stopped taking pictures halfway through. So you get half a picture tutorial, and half words. Sorry about that. It's been a crazy week. I started with a frame from the dollar store. 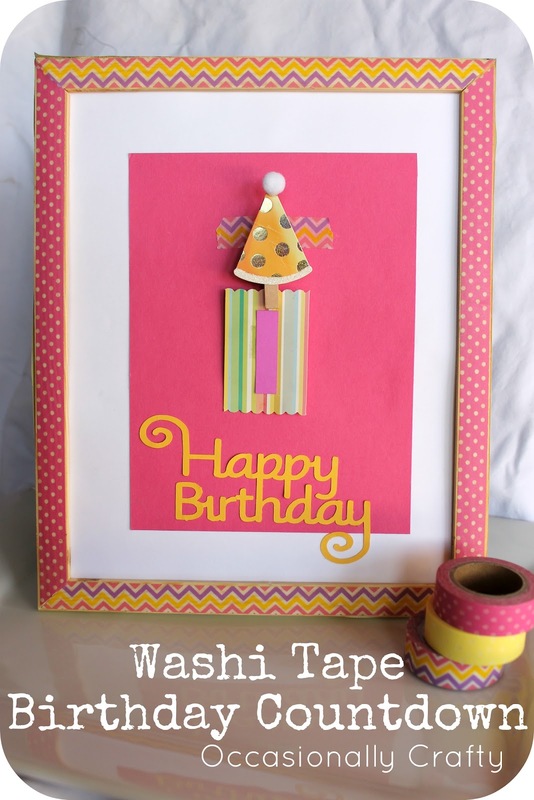 I picked out some washi tape that fit well for a birthday theme, and simply pressed it onto the frame. 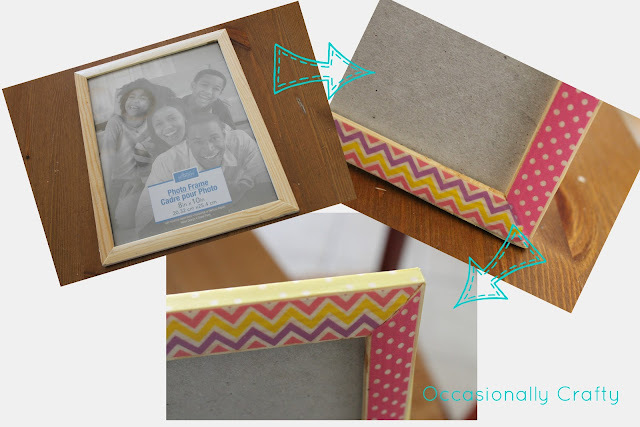 As you see in the 2nd picture, I did cut the corners on an angle so it lined up with the frame and didn't overlap. You could certainly paint first, or use a white frame, if you don't like the natural wood showing through. This was meant to be a quick and easy project, so I don't mind the wood. As you see in the third picture, I did, however, use a third washi tape on the outer edges of my frame, pressed down onto the back so I didn't have to trim or anything. Here's how my frame looked at this point. Next, I took it outside and sprayed a good coat of sealer all over the empty frame. Some of my washi tape doesn't adhere as well to the wood, so the sealer helped it stay in place. A thin coat of Mod Podge would work, too. But if your washi tape is staying in place, you can skip that step. Okay, here's where I stopped taking pictures. How to make the "Countdown"
1. Use the back of the frame as a template and trace a rectangle onto heavy cardstock of your choice to fit the frame. I used white, and actually Mod Podged it on to the cardboard piece for extra stability. 2. Choose a contrasting color of cardstock and cut a smaller rectangle. My pink rectangle was about 5 1/2 x 7 1/2, but you can just eyeball it. 3. Use a glue stick or a very thin coat of Mod Podge to adhere your contrasting rectangle to your base cardstock. 4. Attach your mini-clothespin to the upper center of your smaller piece of cardstock with a dab of glue. Let dry, then cover it with a torn strip of washi tape. 5. Embellish as desired. I used an old party hat from a birthday card I got years ago, and cut the "happy birthday" from yellow cardstock using my Silhouette Cameo. I just used a glue stick to adhere the words, and craft glue for the party hat. 1. Choose a cute piece of patterned paper or cardstock. Cut into 1.5x 2.5 inch rectangles. Use scalloped scissors to embellish the edges, if desired. 2. Use number stickers, chipboard numbers, or your craft cutter to cut numbers as desired. We only count down about two weeks before a birthday, so I went up to 15. You can cut as many as you want. 3. Adhere numbers to your rectangles with craft glue or glue stick. Now I have a cute way to count down to our birthdays! I'm linking up to some of these great parties- come along with me! Also, don't forget to enter all the great giveaways happening this week. They can be found here. You won't want to miss tomorrow- a final giveaway and a BIG announcement! See you soon! Cute project, thanks for sharing the tutorial! this turned out so cute! visiting from Sew Crafty Saturday at Wildflowers and Whimsy. Adorable! You're gonna love Jen's tutorial on making washi tape! This is an adorable idea! I saw it over on What I Learned Wednesday, which is a fun party! 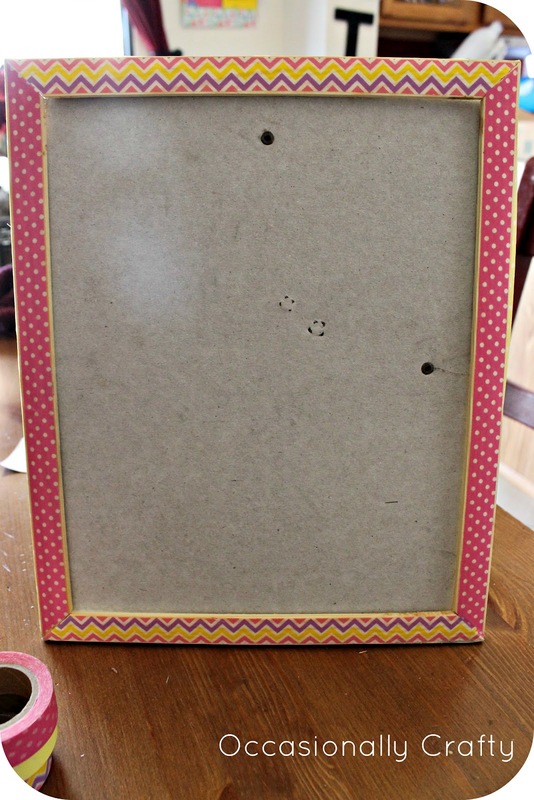 I would LOVE if you stop over at our Crafty Saturday Showcase and linked up this project. It runs from Sat-Thur at noon. Then our designers pick our favorites and feature them on Friday. This would go great in the collection! We also have a linky for ETSY/Business craft link up.